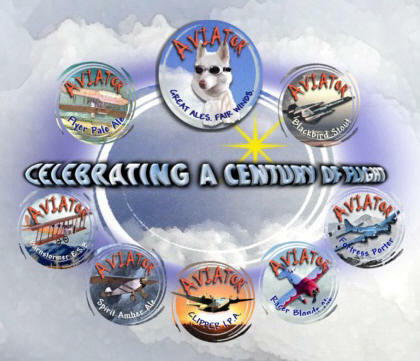 Celebrating one hundred years of flight, Aviator™ Ales are based upon the images, machines, people and events of aviation history and technology, one of the most fascinating and enduring subjects in our culture. The Aviator™ line of craft ales features the Wright Flyer, barnstorming Curtiss Jenny, Gee Bee Racer, Spirit of St. Louis, venerable Flying Fortress, Boeing 314 Clipper, and super-sonic SR-71. Click on one of the aviator™labels above or the brews on the left to learn more. In a range of tastes from pale to stout, Aviator™ ales are crafted to satisfy every palate, and are brewed and bottled by Hale's Ales Ltd. of Seattle, one of the best ale makers in the cosmos.